He was born in 1621 in Amritsar. He established the town of Anandpur. The Guru laid down his life for the protection of the Hindu religion, their Tilak (devotional forehead markings) and their sacred (janeau) thread. He was a firm believer in the right of people to the freedom of worship. It was for this cause that he faced martyrdom for the defence of the down-trodden Hindus. 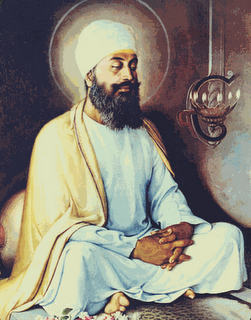 So pathetic was the torture of Guru Tegh Bahadur that his body had to be cremated clandestinely (a follower burned down his own home to cremate the Guru's body) at Delhi while his severed head was secretly taken four hundred kilometers away to Anandpur Sahib for cremation. Because of his refusal to convert to Islam a threatened forced conversion of the Hindus of Kashmir was thwarted.